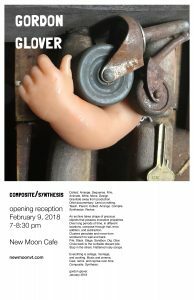 Gordon Glover, an assistant professor of Creative Media in the Division of Communication and Creative Media, is exhibiting a show of his work at New Moon Cafe from Feb. through April. The show is called composite/synthesis and an Artist’s Reception will take place on Feb. 9 at 7 p.m. Along with his mixed media art projects, Glover is a member of the band REDadmiral, which plays at the Light Club on March 23 from 7-8 p.m. This entry was posted in Career, CCM Division, Communication, Creative Media, Events, exhibitions, Faculty, Presentations, Uncategorized and tagged Gordon Glover, Ligh Club, New Moon Cafe, REDadmiral on February 6, 2018 by cmccalister.